Tourist groups and individuals from all around the world marvel at the beautifully decorated halls and at precise architectural details from the beginning of the century. 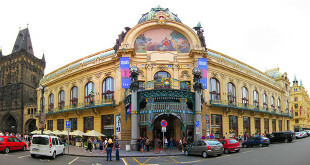 Prague inhabitants often visit the Municipal House for concerts or other various exhibitions. Not many people know that a lot of Czech history has been written there. 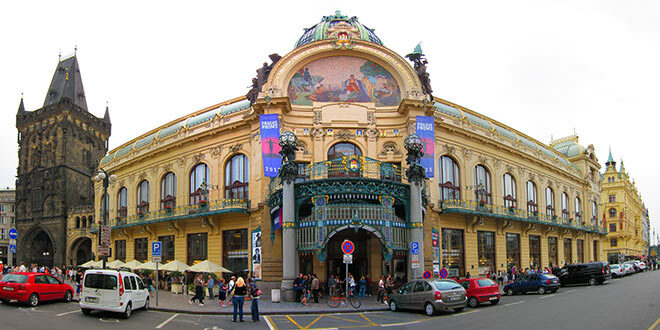 Its decoration, large arched building and position at the end of the street Na Prikopech, opposite to the Czech National Bank, is a proof of its importance. The foundations come from the 14th century. In that time, Wenceslaus IV built his residence at the border of Prague, near the eastern gate. The son of Charles IV chose this place deliberately, in order to observe the movement of supplies of silver from Kutna Hora, where Prague’s coins were being minted. The building was used as the king’s court until the reign of George of Podebrady, mid-15th century. During this period, the Hussites expelled the king to Hradcany, according to Jiri Bukovsky, a Czech historian. The incoming House of Habsburg was not interested in the residence near the city walls, so it was given to Polyxena from Lowkovice, a famous Czech catholic. She soon sold it to Arnost Vojtech Harrach, Prague archbishop. “He built a church museum and a baroque church there, on the left side of the house, parallel with Celetna street,” Jiri Bukovsky explains. The Municipal House supports the Powder Tower, to which a candy store is connected. While men were discussing politics and city issues, the ladies would often go and have something sweet in the meantime. After rebuilding Clementinum into an archive, the church museum moved there. Shortly after that, the Municipal House building was transferred to the military. Since the 1800s there has been a military barracks opposite to the building (currently the Palladium shopping mall). “In 1901 the troops moved to Pohorelec and the whole building was demolished. The items of interest of the church were relocated to the church of St Bartholomew at Prague Castle,” notes Jiri Bukovsky, which ends the early history of the Municipal House. Mr Bukovsky visited the Municipality House to see a concert when he was seven years old, and he also attended dancing lessons there when he was younger. Currently he is a tour guide there, with going on for 23 years of service. Citizens of Prague knew exactly what to do with the lucrative land in the city center. They demanded the building be a Czech social center. The municipal authority therefore announced a public competition for the project, making it known that they were seeking an opulent and representative building for a reasonable, low-cost price. At the same time, the new building had to become a support for the Powder tower, which was lonely, standing at future Republic Square. Judges entertained three bids – from architects Dryak, Pospisil and Balsanek. However, after a second attempt, no one was awarded the project. In the end, the city council commissioned the architects Antonin Balsanek and Ocvald Polivka to build the new Representative House. A nine-member board of experts were closely watching the cooperation of both architects (by the way, excellent! ), and after some difficulties, a budget of three million Czech crowns was approved on 10th December 1904. The building of the house started in January 1905. The final cost exceeded six million in the end, which was an astronomic amount at the start of the 20th century. The driving force for municipal authorities was actually the need to build a beautiful Czech representative palace to outshine the German Casino in Slovansky House. In order to achieve that, they enlisted experts and artists from the Czech Republic (for example Alfons Mucha, Max Svabinsky, Jan Preisler or Frantisek Zenisek.) Expense was not a factor in the endeavor. Municipality House connects three plans in itself from the beginning: public part with gastronomic businesses, representative halls for cultural and social purposes, and closed rooms for political meetings. Its use gradually increased from the year 1909. The ceremonial opening for the public took place on 5th January 1912. The city was renting various parts of the building from the beginning, in order to keep it profitable, and it stayed this way even during the 1st World War. Restaurateur Vasata was engaged with the gastronomy aspects of the building. He opened a cafeteria and French restaurant on the ground floor. These venues are still operational to this day. During the week it is mostly visited by tourists, but on weekends Prague citizens come as well. Once a month there is a special brunch served; for example, on 14th May the restaurant will be serving traditional dishes on the occasion of the 300-year anniversary of Marie-Therese’s birthday. High ceilings, huge windows and original Art Nouveau decoration with live piano music create a very pleasant atmosphere. In the entrance you will be captivated by a magnificent arch in front of you, a so-called “alcove” which optically widens the space. Notice the nymph and the fountain from Josef Pekarek in the front wall of the cafeteria. The big space here is divided by a gallery into more intimate areas. If you long for a beer or traditional Czech dishes, you could go to the restaurant located in the basement. Next to it there used to be an American bar and a wine bar which opened in the evenings. The pub was transformed into the club Repre in the 90s. The Prague underground scene was meeting there and bands used to play until morning. The entrance hall is divided into two parts – from the cloister from the street you enter a circular hall with a cafeteria on the left side and a restaurant on the right. From there you can go to the stylish Pilsner pub and a bar with a wine shop, down the stairs from the foyer. While the entrance hall and the staircase upstairs are made of white Italian marble, the staircase downstairs is decorated with ceramic tiles from the Czech factory Rako. The Municipal House can certainly amaze every visitor. At the time of its birth it was an architectural jewel with many decorative details and technical novelties. “The building is still air-conditioned by the unique original system with a connection to two wells in the basement. It used to be heated by radiators that got heat from the boiler room; it was one of the first completely electrified buildings,” Jiri Bukovsky describes. Although some architects and journalists claimed the creators of the building used an old-fashioned style, the house was radiating elegance and gentility, according to Viennese Art Nouveau architect Otto Wagner. While gentlemen were discussing politics, the ladies could visit the sweet shop and have a coffee or a cake while conversing in ladies’ lounges. Privacy was obtained by glass panels that divide the tables. Interestingly, all the glass light bulbs are still original and completely functional. “Among some main materials found on the ground floor and in the halls in the upper floors, we can find crystal glass and brass decorations. The brass is polished, the crystal glass gleams, and the light multiplies with spectacular effect,” Jiri Bukovsky explains. In the upper halls, the materials are also accompanied with glass, carved wood and gold leaf, including direction signs. A cozy pub and wine bar are decorated with ceramic tiles with motives of hops, barley ears and grapevines, in combination with wooden paneling. Social classes are symbolically separated on a corner behind the reception. Marble near the staircase transforms to ceramic and precise copies of pictures on the walls are also made of ceramic tiles. On the contrary, there are marble staircases and elevators to the upper floors – the presidential one on the right side, and the one for the mayor on the left side. “The president was a mayor’s guest in the Municipal house, which is why the mayor has a more important elevator and why his lounge is located in Smetana’s hall. The elevator ceiling and paneling are inlaid with exotic wood. The elevators were made by the company Ringhoffer, which was manufacturing trams and importing exotic woods for them. A wooden dipterous door opens simultaneously, so that a larger group of people can enter and exit comfortably. For the comfort of visitors, there is also a collapsible upholstered sofa,” says Jiri Bukovsky. The communists wanted to demolish the Municipal House, as it was an undesirable symbol of capitalism. Fortunately, it was too expensive a task to undertake at the time. They renamed it from Representative House to Municipal House. However, for many years people still kept saying that they were going to visit the Repre. The elevator shaft is decorated on every floor with ornaments of laurel leaves with a fan-shaped bunch of leaves of ginkgo biloba, which is a tree of friendship, according to the poet Goethe. Also, leaves of the linden, which is the Czech national tree, are present. Some of the most famous Czech artists participated in the interior’s decoration. All the halls are decorated with wall paintings and carved wooden paneling. “In Mayor’s hall there is silver dust inlaid in oak paneling, in order to enhance the wood grain. In Rieger’s hall, the dust is golden and the whole room is set to a golden accent,” Jiri Bukovsky says. The Municipal House not only served for representative and social purposes, but it was also a place where politicians used to meet. Most of the halls are named after famous politicians. They were mostly using the lounges on the first floor at the time.